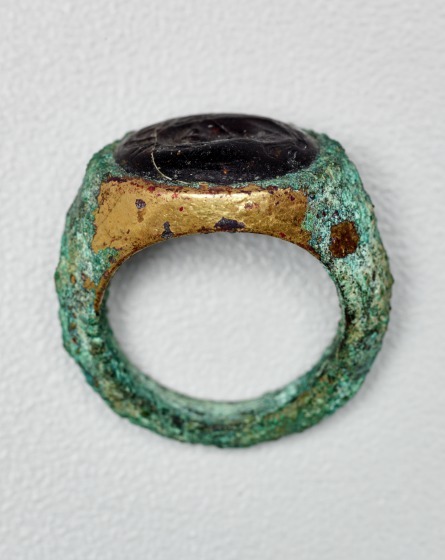 Rings made from sheet gold or gold wire occur in Greek graves dating to the 10th century BCE, and there is constant evidence that simple gold bands or rings were worn as rings in the following centuries. As a result of Egyptian or Phoenician influence, more elaborate forms slowly became popular beginning in the 6th century BCE. 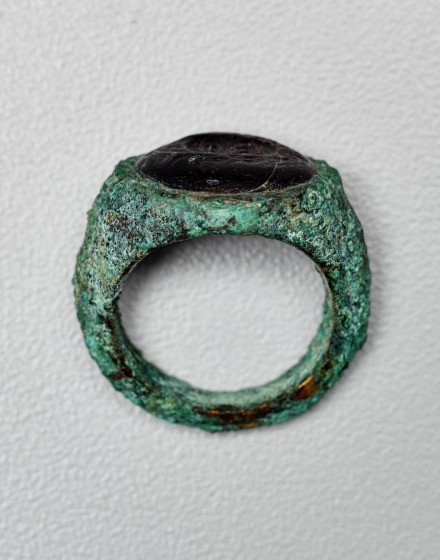 The 3rd to 1st centuries BCE saw an abundance of rings and a large variety in shape and style. 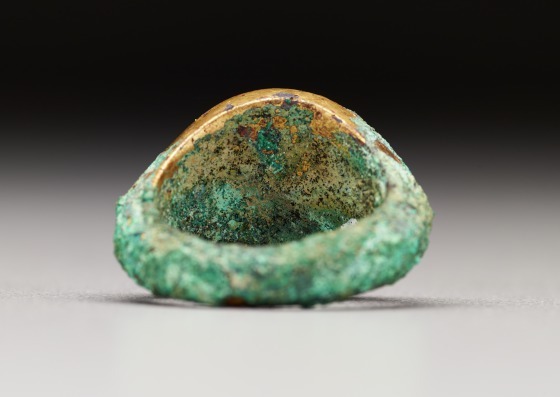 This heavy, solid ring, hexagonal in side view, has a rounded hoop. The outside is slightly convex and angular; the inside flat. The shoulders, which are fluted lengthwise, slop inward. 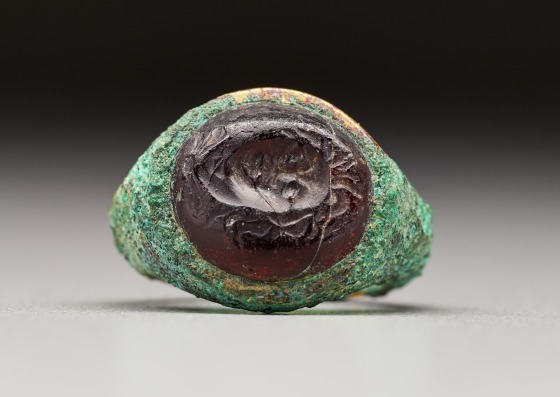 The flat, nearly circular bezel is inlaid with a garnet intaglio, which shows the head of Medusa in three-quarter view turned toward the left. Wavy hair frames the face. The pathetic expression is stressed by deep-set eyes and a half-open mouth. Snakes are tied around the neck and knotted in front. 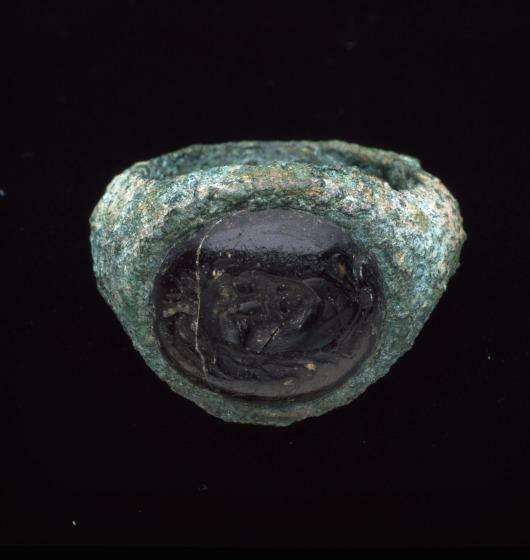 The engraved gem is cracked in several places. 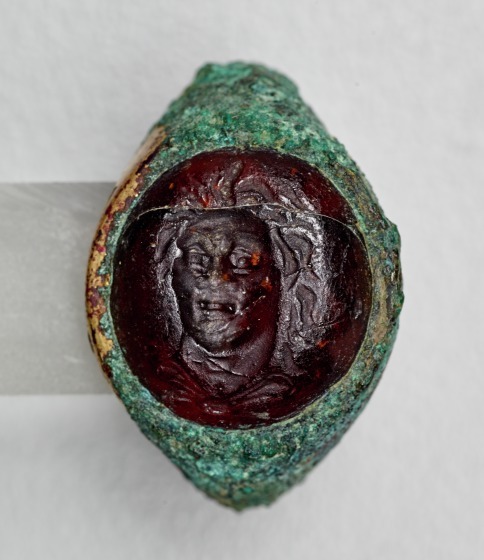 Barbara Deppert-Lippitz, Ancient Gold Jewelry at the Dallas Museum of Art, (Dallas: Dallas Museum of Art in association with the University of Washington Press, 1996), 66; 140-41.